Matthew 24.16 - This gospel of the kingdom shall be preached throughout the world for a witness unto all nations. And then the end will come. " Let's look at the conveniences of the modern world. All the technology that we are surrounded on all sides. Nowadays, information transmitted via the Internet, satellites from one end of the world to another within a few seconds. So you can look at any information, whether good or bad character through the Internet, satellite around the world. The Bible, a book inspired by God our Creator has been translated into many languages and dialects, based on cost millions and spreads in its printed form to the world. We have the Bible but also in many languages on the Internet. You can take it around the world without studying the issue online. Any term, word search you can search the Bible online in a few seconds using a search engine. You do not even have a deep knowledge of the Bible and found in a little while to find what you need. Today, I found many web sites in many languages to write Biblical truth and spread it to the world. They point to the true law of God and proclaim the speedy coming of our Lord Jesus Christ. 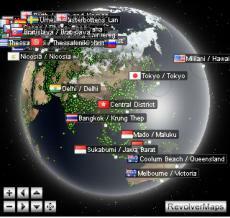 Using the Internet to spread the truth to all corners of the world as a testimony to all nations. There are many Christian Internet and satellite television (www.hopetv.org, 3angelstube.com, www.amazingfacts.tv) Biblical truths that transmit 24 hours a day in many languages throughout the world. They publish the books and Biblical literature, DVDs and spread the overhead cost to the world. Today, aircraft and vehicles is not a problem to transport from one corner to another within a few hours. There are many missionaries who travel around the world and the most remote corners of the world. Three angels preach messages soon coming of our Lord Jesus Christ to the world. A good example is the air missionary David Gates. As is written in the Bible, the gospel of the kingdom shall be preached throughout the world for a witness unto all nations, and is really going on. Today's modern era allows you to spread the gospel to the world like lightning. And then comes the end .... ready for it! The call for a Sunday law in the U.S.